Washington State Ferries has sold the 63-year-old vessel the Evergreen State to a group that plans to use it in the Caribbean. After a decades-long career in Washington, the state’s oldest ferry will spend its twilight years right. The 310-foot vessel, called the Evergreen State, is heading to the Caribbean, after Jones Broadcasting, LLC. bought the ship for $300,000, Washington State Ferries announced Wednesday. The new owners plan to use the vessel for ferry service in protected waters of the southern Caribbean Sea, the state agency said. The ferry first entered service in Washington in 1954. The Evergreen State went up for sale last year after the vessel spent years as a backup ship when other ferries went out of service. Jones Broadcasting, LLC. will tow the ferry from the Pacific Northwest to Grenada when the region’s weather improves, likely in the summer. “She served our customers well for six decades, but it is important that she is sold so we can free up dock space and focus maintenance on our current fleet,” Ferries Chief of Staff Elizabeth Kosa said in a news release. 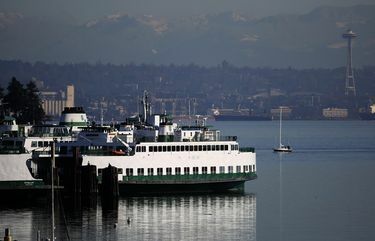 The Evergreen State was custom built for the system, featuring drive engines from a surplus World War II destroyer, with the potential of carrying up to 854 passengers and 87 vehicles, State Ferries said. The agency last year also auctioned off the 162-foot, 50-year-old Hiyu, the system’s smallest ferry. A local business owner bought that vessel last month for $150,000 with plans to use it as an entertainment venue on Seattle’s Lake Union. Both ferryboats had celebrated careers with the state ferry system, carrying tens of thousands of passengers and vehicles. A new Olympic-class 1,500-passenger, 144-car ship will launch on Ferries’ Seattle-to-Bremerton route this summer and the system will add another new ship next year. On Wednesday, Sterling said the shipbuilder of the 2017 vessel tested it for the first time in Elliott Bay.